Johan Kristoffersson made rallycross history today as the PSRX Volkswagen Sweden driver became the first driver to win four consecutive rounds of the FIA World Rallycross Championship presented by Monster Energy. It is also the Swede’s eighth podium in a row – another World RX record. Frenchman Sebastien Loeb finished second at the Bretagne World RX of France in front of a home crowd of 75,000 while reigning World RX Champion Mattias Ekstrom rounded out the podium. In the RX2 International Series presented by Cooper Tires, Frenchman Cyril Raymond was crowned the 2017 Champion on home soil. There is still one RX2 round remaining [Gumtree World RX of South Africa] but Raymond seals the title early as no driver can mathematically beat him on points. Belgium’s Guillaume De Ridder finished runner-up, while Russia’s Vasily Gryazin took the third podium spot in his best finish of the year. “This is fantastic, I am so confident with the car and it is a result of the hard work from the team,” enthused Kristoffersson, who has extended his lead at the top of the World RX driver standings over team-mate Petter Solberg by 46 points. Kristoffersson was also awarded the Monster Energy Super Charge Award for his rapid start off the line in today’s final. Hoonigan Racing Division’s Andreas Bakkerud finished fourth after a solid weekend in the Ford Focus RS RX Supercar. A front-right puncture for Solberg in today’s final thwarted the Norwegian’s progress and he eventually finished fifth. Team Peugeot-Hansen’s Timmy Hansen won the second semi-final in order to start on the front row of today’s final alongside Kristoffersson. The Swede won Loheac RX two years ago but was unable to repeat the victory following a gearbox problem, forcing him to retire on lap four of the final. 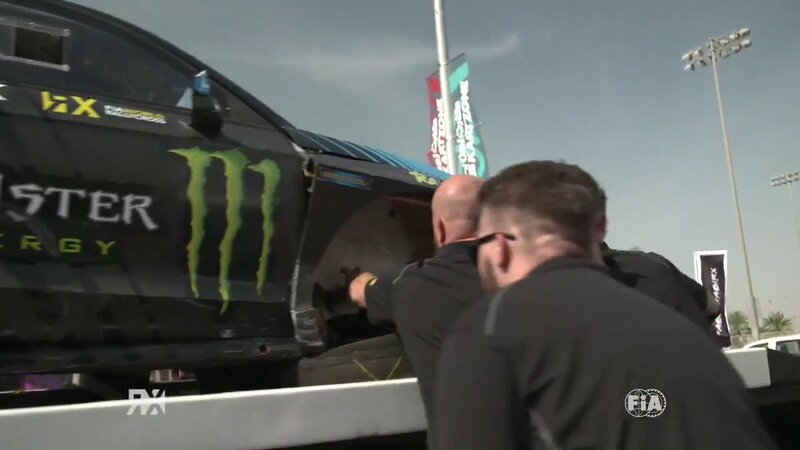 America’s Ken Block finished seventh overall, the Hoonigan Racing Division driver having had an impressive weekend after lying third overnight after day one. Last year’s Euro RX champion Kevin Hansen finished eighth, while MJP Racing Team Austria’s Timo Scheider ended the event in ninth place. STARD’s Janis Baumanis rounded out the top ten, while EKS team-mates Topi Heikkinen and Reinis Nitiss finished 11th and 12th respectively. In the penultimate round of the FIA European Rallycross Championship (Euro RX), Norwegian Thomas Bryntesson took a well-deserved victory to be best of the 35 Supercars competing in the fully-subscribed category. “This is the best result of my career,” beamed Bryntesson who finished runner-up in RX2’s precursor, RX Lites last year. Hungary’s Tamas Pal Kiss finished runner-up, while the 2016 French Rallycross Champion Firmin Cadeddu took the third podium spot. Sweden’s Anton Marklund finished fourth and continues to lead the standings by 18 points (despite a five-point penalty for receiving a third reprimand). The battle for Super1600, meanwhile, heated up this weekend as last year’s Champion Krisztian Szabo took the win and moved one point ahead of Latvia’s Artis Baumanis in the overall standings. Frenchman Maximilien Eveno and Denmark’s Ulrik Linnemann finished second and third respectively. Round ten of the World Championship moves to Eastern Europe as World RX prepares for the second-ever Neste World RX of Latvia in downtown Riga (15-17 September). Emmanuel Anne #29, loss of ten Championship points for presenting a turbocharger for sealing after initial scrutineering. Andreas Bakkerud #13, five-second penalty for pushing and overtaking in Q3. Toomas Heikkinen #57, reprimand for pushing car #96 in Q3. Ken Block #43, reprimand for pushing in semi-final one. Jonathan Pailler #18, loss of ten Championship points for presenting a turbocharger for sealing after initial scrutineering. Nabil Karam #35, loss of ten Championship points for presenting a turbocharger for sealing after initial scrutineering. James Grint #27, disqualified from Q1 for pushing another car and causing a collision. Riku Tahko #12, reprimand for pushing car #27 in Q1. Robin Larsson #4, 15-second penalty for pushing car #102 in Q2. James Grint #27, fined €500 for absence of an FIA Technical Passport at initial scrutineering. Tore Kristoffersen #32, disqualified from Q3 for causing a collision with car #56. Patrick Guillerme #83, reprimand for not respecting the car beside him in Q3. Rokas Baciuska #14, €500 fine for not attending noise check at the correct time. Timur Shigaboutdinov #89, reclassified last in Q1 for not respecting the car on the standard lap at the exit of the joker lap and causing a collision. Jimmy Terpereau #37, reprimand for pushing car #17 in Q3. Artis Baumanis #17, reprimand for pushing car #2 in Q3. Rocas Baciuska #14, reclassified sixth in the final for pushing and overtaking. Timur Shigabiutdinov #89, reprimand for pushing car #36 in semi-final two. Josef Susta #16, reprimand for pushing and overtaking in semi-final one. Tanner Whitten #11, disqualified from Q2 for being underweight. William Nilsson #6, ten-second penalty for pushing car #26 in Q4.